The moment I heard that this book was on the horizon last year, I knew it was one that I had to read. But I could never have anticipated how tightly the release of The Surrender would intersect with my own fledgling efforts to put a voice to my own journey. The precipitous timing coloured not only how I read, but how I would go on to write about this book. 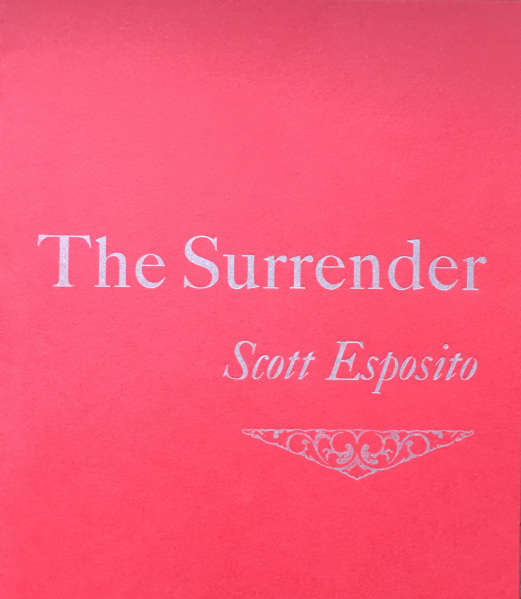 I entered Scott Esposito’s sensitive and intelligent three part essay into the heart of his own gendered identity armed with two notebooks. In one I catalogued my observations about the essays themselves–the structure, the form, and the content–while the other captured the flow of emotion, the moments of recognition, the ideas that spoke to my soul. One could say that I surrendered to this book. But I could only review it by putting my deepest personal reactions to one side and allowing Scott and his accounting centre stage. To do anything else would have been self indulgent, unprofessional. At the same time I simply wanted to open the work to the point that other readers would be drawn to enter in. One deserves to hear a story like Scott’s directly. For my part, writing about The Surrender was an absolute joy. Thank you to Tomoé Hill at the wonderful Minor Literature(s) for entertaining my review. You can read my review and see the original photograph I created to accompany it here. This sounds fantastic and your review was really good! My library doesn’t have it yet. I hope they get it soon. Thanks Stefanie. It comes from a very small publisher (I supported the Kickstarter fundraiser) but if you want to suggest that your library order it, I’ll check with Scott for details.